As Canadians, we are proud of our universal health care system, which provides publicly-funded essential doctor and hospital care based on need and not ability to pay. Unfortunately, our health system falls short when it comes to prescription medication. Prescription bottles and pills on a counter. Canada is the only industrialized country in the world to have a universal health system without also providing a publicly funded pharmacare program to cover the cost of prescription medication outside of hospitals. What this means is that the majority of Canadians pay for their prescription drugs privately -- either through private insurance programs or out-of-pocket. Canadians also pay some of the highest prices for prescription drugs in the developed world, thanks to a patchwork system of negotiating drug prices that undermines our collective clout. The result is that many Canadians can't afford the medications their doctors prescribe for them -- as many as one in five according to a national poll -- and some may even be skipping them altogether, with possible catastrophic health consequences. So saving even a few bucks per prescription could add up to a big savings over time. Here are four ways you could save money on your prescription medication. 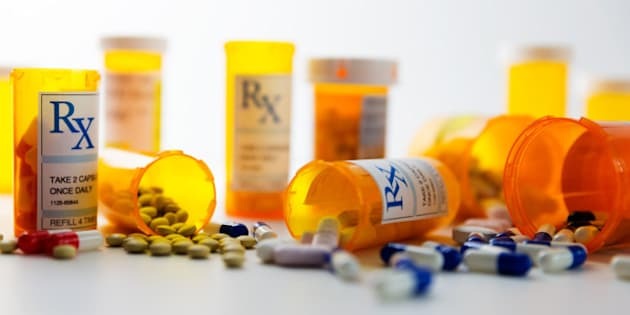 Never stop a prescribed medication without consulting your doctor because reducing or stopping a medication altogether could have serious health consequences. However, it is worth asking your doctor if you need to be on the medication in the first place. Campaigns such as Choosing Wisely Canada, in partnership with the Canadian Medical Association, have released suggestions to help avoid unnecessary medical tests and treatments that the best available evidence shows do not enhance care. For example, taking antibiotics for a viral infection is ineffective. Other organizations, such as the Deprescribing Network, warn against over-medicalization, particularly for seniors. Often medications that were once useful, no longer need to be taken, and may even be causing unnecessary harm. It is always useful to review your medications regularly with your doctor to make sure you are on the lowest dosage required, to weigh the benefits and risks -- and to consider if you need the medication at all. More affordable generic prescription drugs have identical medicinal ingredients as their more expensive brand name counterparts. This means that the cheaper generic drug has the same benefits, risks and side-effects as the brand name, and has gone through the same quality standards testing with the government. The only differences may be in the non-medicinal ingredients. And, of course, the price, which can be substantial. Newer medications typically won't have generic equivalents -- because of drug patent protections in Canada -- but most health conditions can be treated with cheaper generic drugs. When you purchase your prescription drugs at a pharmacy, check your receipt and you'll see you are charged a professional 'dispensing fee' each time you buy your medication. The fee charged can vary widely from pharmacy to pharmacy -- by several dollars -- so it can add up quickly. Be sure to compare dispensing fees for the pharmacies in your area. Also, in some provinces, even the price the consumer pays for medications can vary from pharmacy to pharmacy, so do a quick price check to get the best deal. If you have taken the drug for a long-time and, on recommendation from your physician, know you will be taking it for a long-period still, getting the prescription filled less frequently can also save money on repeat dispensing fees. When price checking, keep in mind that you can find pharmacies in many locations now -- inside medical centres, grocery stores and even big box stores -- and they all have licensed pharmacists. Pharmacists can be good sources of information so if you find one that takes the time to provide consultation and advice, weigh the quality of care you receive with the dispensing fee. Each province, and some federal programs, have subsidized or partially-subsidized coverage of medicines for certain groups of people, such as those with disabilities, those under certain income levels, seniors, native populations and refugees - so check to see if you are eligible. Guidelines have been newly created for physicians in Ontario, Manitoba, BC and other provinces to help connect patients with government programs, including prescription drug coverage -- so ask your doctor for more information. Non-profit organizations, such as those focusing on a specific disorder or disease, or those for seniors, often have resources to help connect patients with government programs. If you are still unsure, ask your provincial member of parliament for help pointing you to programs you may be eligible for. You may also want to ask them why Canada doesn't have a national pharmacare program yet while you are at it.